These are the parts of the Divine Service, that is the chief worship service by which we celebrate Holy Communion. They are basically the same in all orthodox Lutheran hymnals. This order of service is not unique to Lutherans. We did not invent it. It is the ancient form of worship that has been developed among Christians the world over from the very beginning of the New Testament era. It is based exclusively on scripture and is focused completely on Jesus Christ and His saving grace on the Cross of Calvary. Because of our sin, we cannot come to God, but God must come to us. This is what takes place in the Divine Service. 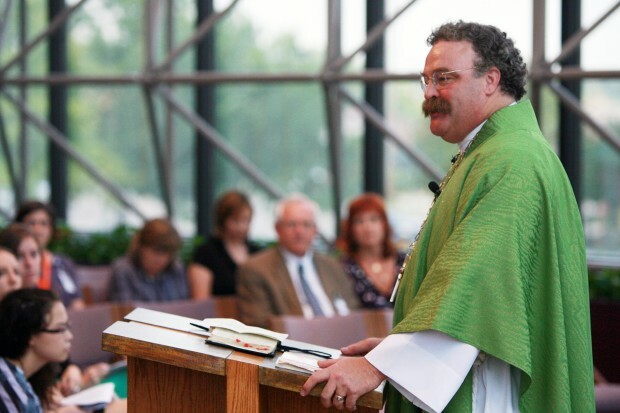 Through the Word and Sacraments God speaks to His people. He reminds us of our sinfulness and failure to love completely and He then forgives us and assures us of the grace we have in Jesus Christ. This grace is central to our lives as Christians and we must treat it with all reverence and respect. It was not of our doing and it is not ours with which to tamper. Therefore worship is not a matter of novelty or entertainment, much less a matter of attempting to please the masses. For this reason we choose hymns that are doctrinally sound and theologically significant to round out our worship. Hymns, like the Divine Service, must reflect this Christo-centric “God coming to man” theology or else they are unfit for the service. May our worship always be pure and always emphasize this Biblical Christo-centric attitude. INVOCATION: Since we are Trinitarian we call upon the Triune God to bless. The Trinitarian invocation also recalls our Baptism. The Invocation is addressed to God, so the pastor will face the altar. Facing the altar, the sign of the cross connected to the invocation is a personal signature, and it is appropriate that all may join in this act as a remembrance of their baptism. CONFESSION AND ABSOLUTION: As Christians, our lives are to be lives of continual repentance as God promises eternal forgiveness. If we confess our sins, He is faithful and just and will forgive our sins and purify us from all unrighteousness. 1 John 2:9. The Service of the Word is the second part of our Divine Service. The purpose of the Service of the Word is to present Christ to the assembled congregation as they prepare to meet him in his Supper. INTROIT: The Introit is a collection of passages from scripture that set the tone for the service. The verses chosen are different each Sunday and reflect the theme of the Gospel reading to come. It is itself scripture. KYRIE: As we draw toward the reading of God’s Word we join with all the faithful through the ages and ask the Lord for mercy. The Kyrie (from the Latin Kyrie, eleison, “Lord, have mercy”), is a litany, the first prayer of the gathered congregation. GLORIA IN EXCELSIS OR HYMN OF PRAISE: The Pastor begins with the angelic hymn in Luke 2: 14.:Glory to God in the highest, and peace to His people on earth. The congregation follows with the earthly confirmation of the praise. The Collect is preceded by the Salutation. The Salutation is indicative of the special relationship between the congregation and its representative before God – their called Pastor. OLD TESTAMENT and EPISTLE READING: Selected portions of the Word are appointed to be read according to the arrangement of the church year. It has been traditional for the congregation to be seated for the reading of the Old Testament and Epistle Readings, because these are seen as instruction in contrast to the Gospel which is an account of the life and words of Jesus, the Lord of the Church. VERSE: In response to the Epistle we sing the appropriate verse. GOSPEL READING: The Gospel is properly announced and read by the pastor or an ordained assistant, as part of his work in the holy ministry of Word and Sacrament to proclaim the person and work of Christ to all..
CREED: The Creed is a solemn confession and response of faith to the Word which has just been proclaimed and heard. The Nicene Creed is the proper Creed for Sunday and festival celebrations of Holy Communion because of its expanded confession of the person and work of Jesus, the Christ. HYMN OF THE DAY: also sometimes known as the Sermon Hymn; it highlights the theme of the day and/or the theme of the Sermon which follows. OFFERING: The gifts that are shared represent the gifts of creation and are offered as a sacrifice of thanksgiving to the Lord that by means of them he might accomplish his purpose to bless his people. 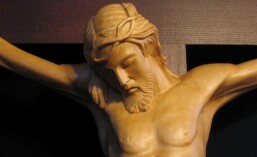 PRAYERS: Here we pray that what we have heard from God may be taken to heart. We also ask God to take care of our needs. We give Him thanks, praise and honor as well. 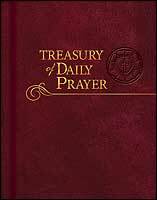 OFFERTORY: The Offertory allows us to accompany our gifts to the Lord with praise for his many benefits in our lives, the very benefits from which our gifts were taken. 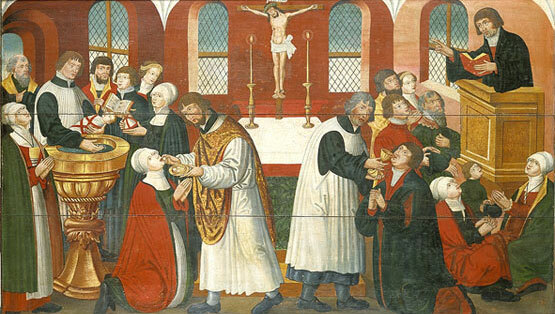 In the Service of Holy Communion God joins His act and deed to His Word; He gives us the body offered and the blood shed for the forgiveness of our sins and for strength for Christian living. PREFACE: There is little in the liturgy of the Evangelical church that is older than the versicles and responses, the dialogue between the Pastor and the people, known as the Preface. PROPER PREFACE: During the major Festival seasons of the Church year the Proper Preface gives glory to God recalling the specific mercy emphasized during that season and leads into a united praise of the Church on earth, the saints above, and all the heavenly hosts, worshiping the Holy Trinity in the Sanctus. SANCTUS: The people’s response to the Proper Preface is the Sanctus. The text is built on the opening verses of Isaiah 6 and John 12:41. 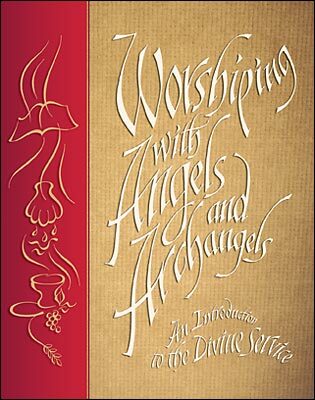 In the BENEDICTUS, we join with the angels, archangels and all the company of heaven in singing. THANKSGIVING: Before the altar, the presiding pastor offers the Prayer of Thanksgiving on behalf of the assembled congregation. This sets the proper framework for our “remembering” – participation in the worship that God has established and blessed through Word and Sacrament. LORD’S PRAYER: The Lord’s Prayer, is the “Prayer of the Faithful” children of the heavenly Father who tenderly invites them to call upon Him as his beloved children. This is the family prayer of the Church of Christ. WORDS OF INSTITUTION: In the Words of Institution, the Pastor recites the Words of Jesus Himself. In these words Christ Himself assures us that He is indeed bodily present in the sacrament of Holy Communion and that through it our sins are forgiven. THE PEACE: In anticipation of the blessings to be received through the Body and Blood of our Lord in, with , and under the bread and wine, the Pastor and the people announce the peace of God to one another; as did Christ Himself on that first Easter. AGNES DEI serves as a hymn of adoration to the Savior who is present in the Body and blood. For this reason it has not been seen in the liturgies of the Reformed churches. 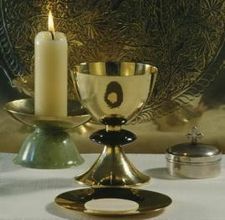 THE DISTRIBUTION: In communion, we receive the Body and Blood of our Lord Jesus Christ. Through it our sins are forgiven because we have been given faith in the words “Given and shed for you” in our baptism. At this, the climax of the second half of the Divine Service, we are reminded of the way in which we began, reminiscent of our baptism. POST-COMMUNION CANTICLE and PRAYER OF THANKSGIVING: Following reception of our Lord’s forgiving Body and Blood, we join in singing a hymn of thanks.”Amen…” We add our own and the Church’s undying gratitude in this Collect of Thanksgiving–a prayer that the gifts now received from the Lord may accomplish His purpose in His people. BENEDICTION: also known as the “Aaronic Blessing,” or the “Priestly Blessing,” is the blessing the Lord directed Moses to use when he blessed the people in the Lord’s name. A fuller treatment of the parts of the Divine Service can be found under the CATEGORY: How Lutherans Worship. This entry was posted in Divine Service & liturgy, How Lutherans Worship and tagged Divine Service & liturgy, Holy Communion, Worship. Bookmark the permalink.